Many people keep asking about index scans in PostgreSQL. This blog is meant to be a basic introduction to the topic because many people do not seem to be aware of what the optimizer does, when a single query is processed. I decided to give a brief introduction showing, how a table can be accessed in some of the most basic cases. Let us get started with PostgreSQL indexing. Indexes are somehow the backbone of good performance. Without proper indexing your PostgreSQL database might be in dire straits and end users might complain about slow queries and bad response times. It therefore makes sense to see, which choices PostgreSQL makes, when a single column is queried. If your table is almost empty, you will never see an index scan because it might be too much overhead to consult an index – it is cheaper to just scan the table directly and throw away some rows, which don’t match your query. 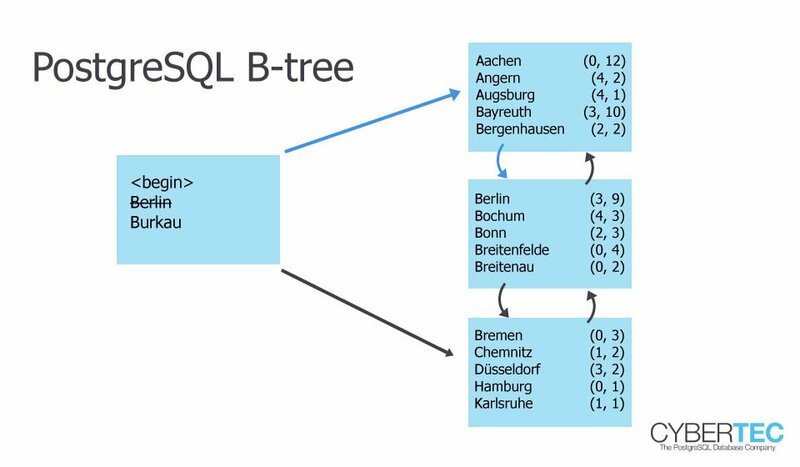 In PostgreSQL a btree uses Lehman-Yao High-Concurrency btrees (which will be covered in more detail in a later blog). Selecting only a handful of rows will be super efficient using the index. However, if more data is selected, scanning the index AND the table will be too expensive. 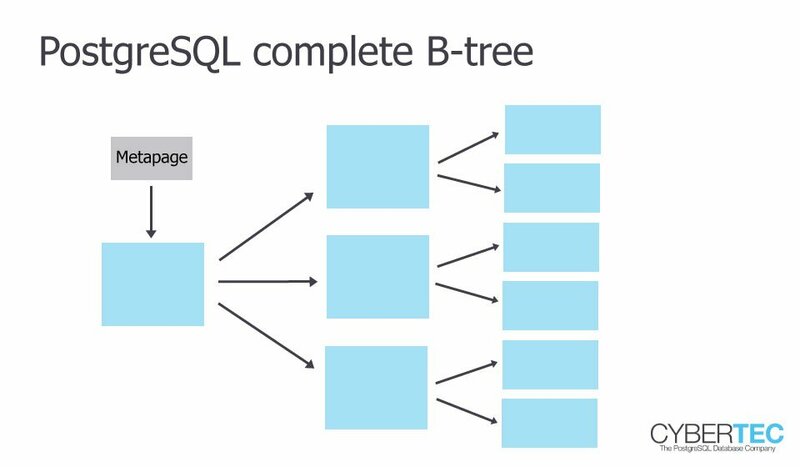 However, if you select a LOT of data from a table, PostgreSQL will fall back to a sequential scan. In this case reading the entire table and just filtering out a couple of rows is the most way to do things. PostgreSQL will filter out those unnecesssary rows and just return the rest. This is really the best thing to do in this case. 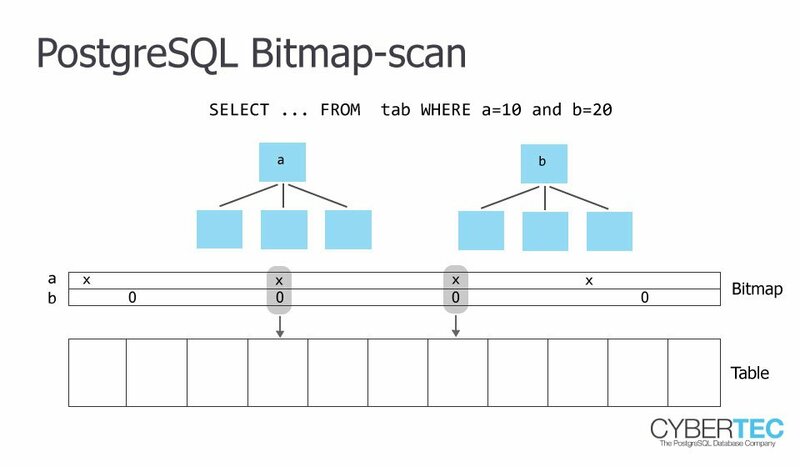 A sequential scan is therefore not aways bad – there are use cases, where a sequential scan is actually perfect. Still: Keep in mind that scanning large tables sequentially too often will take its toll at some point. If you only select a handful of rows, PostgreSQL will decide on an index scan – if you select a majority of the rows, PostgreSQL will decide to read the table completely. But what if you read too much for an index scan to be efficient but too little for a sequential scan? The solution to the problem is to use a bitmap scan. The idea behind a bitmap scan is that a single block is only used once during a scan. It can also be very helpful if you want to use more than one index to scan a single table. PostgreSQL will first scan the index and compile those rows / blocks, which are needed at the end of the scan. Then PostgreSQL will take this list and go to the table to really fetch those rows. The beauty is that this mechanism even works if you are using more than just one index. Bitmaps scans are therefore a wonderful contribution to performance.